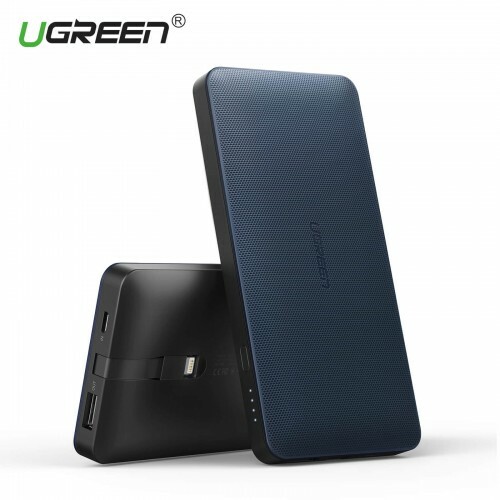 UGreen 10000mAh MFI apple certified Power Bank portable charger comes with 10000mAh compacity, which can charge iPhone X 5 times,iPhone 8 5 times and iPhone 8 Plus 5 times, Samsung Galaxy S8 5 times and S8 Plus 4.1 times. 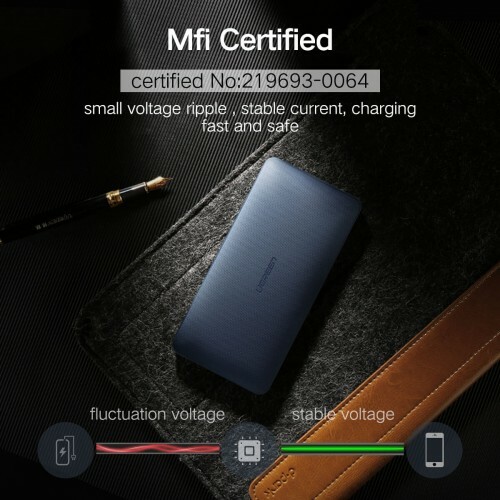 It can be regarded as a backup battery for trip, hiking and working.This power bank built-in Lightning Cable, MFI Certified Battery Charger. 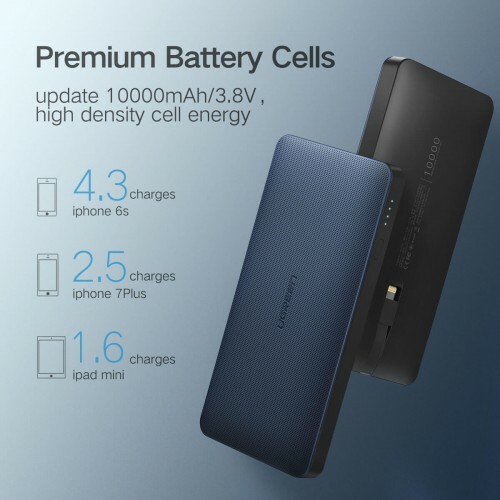 The battery pack has built-in lightning cable and MFI Certificate that is designed for iPhone and iPad with Max. 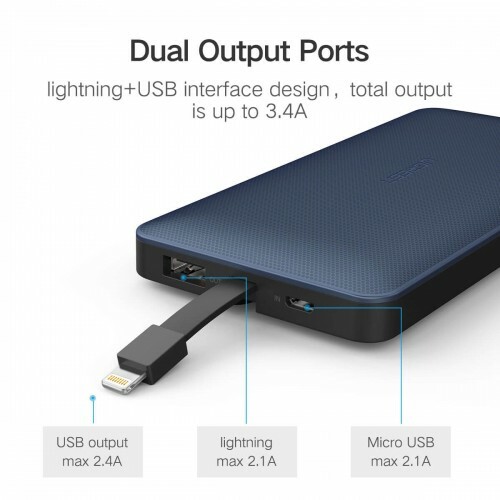 5.1V/2.1A output.There is a slot for managing the lightning cable, when it can be put in the slot when not in use.When using the buil-in lightning cable, you do not need to press the power button, it will detect your Apple device and charge it automatically after your device is connected. When they disconnect, the power bank will power off automatically. The battery pack comes with over current protection, over voltage protection, overcharge protection, over discharge protection, over temperature protection and over power protection, which makes your device safe when charging.Here 4 LEDs indicates power condition which are less than 5%: the Last LED Blinking, LED on: 6%-25% Power, LEDs on: 26%-50% Power, LEDs on: 51%-75% Power, LEDs on: 76%-100% Power. 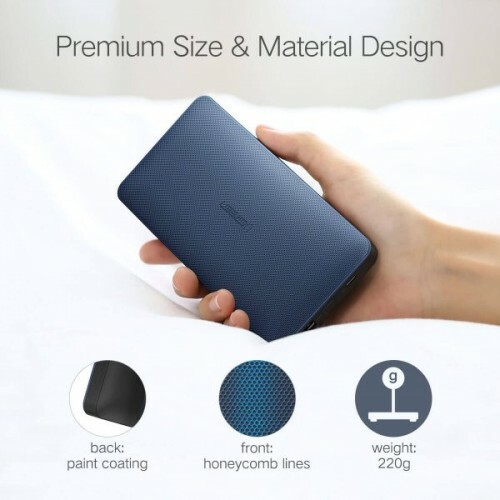 Other features of this power bank are MFI Certificated Number: 219693-0067, Input: Micro USB Port, Max.5V/2.4A, Compacity: 20000mAh/3.7V, Total Output: Max.5.1V/3.4A, Lightning Output: Max.5.1V/2.1A, USB Output: 5.1V/2.4A, Battery Type: Lithium polymer battery, Battery energy: 10000mAh 3.8V (38Wh), Rated capacity: 6500mAh (TYP 5.1V 1A), Charging Limited Voltage: 5.25V" and lightning Cable Length: 10cm/3.9 inch. The automatic detection and charging without the need for powering on can only be used for the built-in lightning cable charging, not for USB port charging.